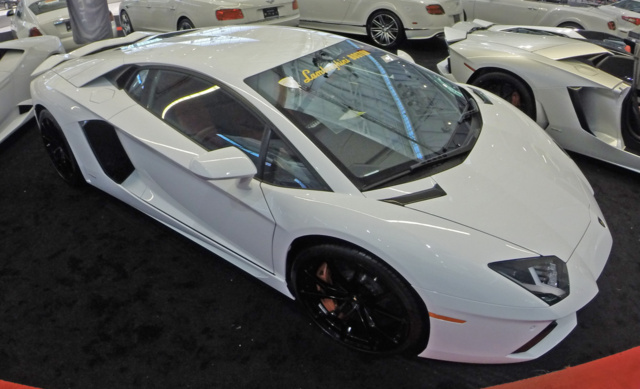 CarGurus has 126 nationwide Aventador listings starting at $244,900. Looking like Salvador Dali’s interpretation of a Ninja Turtle, Lamborghini’s 2015 Aventador continues to draw admiring stares, even when standing still. This 2-seat dream machine returns to underline just about everything you’ve pondered about automobile design, driving excitement and street-legal speed. Of course, it’ll also set you back nearly a half-million dollars for the privilege. The Italian automaker’s Cubist poster child and its most popular production offering still comes in both coupe and roadster (convertible) form, with both available in either the Base or the up-ticked Aventador Anniversario edition (which some reviews still call the 50 Anniversario). The Anniversario is a holdover from 2014’s 50th anniversary trim and boasts a more powerful version of the standard V12 engine as well as some tweaks to the carbon-fiber body to give it a more aerodynamic profile. Further trim delineations slot this high-end performance potentate into the basic LP 700-4 and the Anniversario LP 720-4 iterations. Although it’s roomy enough and boasts a sleek interior that wouldn’t look out of place in the next Star Wars flick, the Aventador remains short on serious comfort. While the front-positioned trunk might hold a few grocery bags in the coupe variation, those removable roof panels that give the drop-top Roadster its open-air appeal have to be stashed somewhere. Face it, this elegantly adorned aesthete is not intended for airport schlepping, mall hopping or soccer-team toting. Despite its carbon-fiber shell, the Aventador is still a hefty vehicle (3,700 pounds), thus a majority of reviewers cite a ponderousness in cornering that Lamborghini tries to mitigate with the full-time all-wheel-drive (AWD) system that remains standard throughout the lineup. Take this superstar on a straight trek to the country club or back to the mansion, however, and its sheer power will put a smile on even the most Scrooge-like countenance. Again for 2015, the Aventador’s standard rear-mounted 6.5-liter V12 powerplant cranks out 690 hp and 509 lb-ft of torque in the LP 700-4 trim level as it returns under the management of the sport-tuned 7-speed auto-manual transmission. Taking things a step further, the 50 Anniversario LP 720-4 edition boosts the grunt from this same engine to 710 hp and 509 lb-ft of torque, still with the 7-speed auto-manual gearbox. This transmission, by the way, features an independent shift rod (ISR) and offers 5 different driving modes. Using the manual mode, drivers can choose Stada (street), Sport or Corsa (track) selections to get the most out of the V12, while the automatic setting, used mostly when resting up on the drive home from the latest polo match, offers only the Strada and Sport modes. Curiously, a number of media types claim little difference in performance between the base and the Anniversario iterations of the 2015 Aventador, citing the Anniversario’s attractiveness as a collector’s edition to be its main claim to fame. If, however, the Anniversario continues as a standardized trim, one wonders about its uniqueness. But no matter its perceived collector's value, a 0-60 time under 3 seconds and a 217-mph top end make the 2015 Aventador among the fastest production cars on the road today. The 2015 Aventador still puts a sparkle in the eye of your typical oil baron with its mileage numbers of 11 mpg city/18 highway in coupe form and 10/16 for the Roadster. All this conspicuous consumption continues despite standard cylinder-shutdown technology when cruising at highway speeds, and an auto engine stop/start feature that shuts the engine down at a red light, then restarts it when the accelerator is depressed on green. Further drivetrain enhancements include launch control and hill-start assist. Look for 19-inch alloy front wheels and 20-inch rear alloy wheels to return aboard the 2015 Aventador, with both sets mounting performance tires for maximum traction. Heated, power-folding, power-adjustable mirrors also adorn its futuristic profile, which can be raised and lowered with an adjustable-height suspension system even as driving dynamics are enhanced with a retractable rear spoiler. Inside, leather upholstery is complemented by automatic climate control, full power accessories, tilt-wheel steering, copious carbon fiber cabin accents and an LCD gauge cluster. Techno-wise, look for this motorized Italianate marvel to boast Lamborghini’s interpretation of Audi’s Multi Media Interface infotainment display interfaced with Bluetooth hands-free technology, standard hard-drive-based navigation and a premium audio systems. The roadster, furthermore, adds a power-opening rear window, a wind deflector and a distinctive rear hood with see-through panels that allow passers-by a look at the massive V12 at rest. Notable options, meanwhile, include nearly unlimited customization of colors, materials and wheels, as well as personalized positioning of features, badges and accents via Lamborghini’s touted Ad Personam program. More mundane things like heated seats, a multifunction steering wheel, an upgraded stereo and a remote garage door opener remain available as standalone extras. Standard safety equipment (which one gets the impression Lamborghini packs into this top-shelf toy only in grudging acceptance of the way things are these days) includes 4-wheel antilock brakes (ABS), front side-mounted airbags with head protection-chambers, daytime running lights and high-intensity-discharge (HID) headlights. An available Parking Assist Package offering a rear-view camera and front and rear parking sensors is once again optional for the 2015 Aventador. What's your take on the 2015 Lamborghini Aventador? NickLuc Lamborghini Aventador LP750-4 SuperVeloce Review https://www.youtube.com/watch?v=sVWouKjugS0 you can look it thought my video really beautyful! 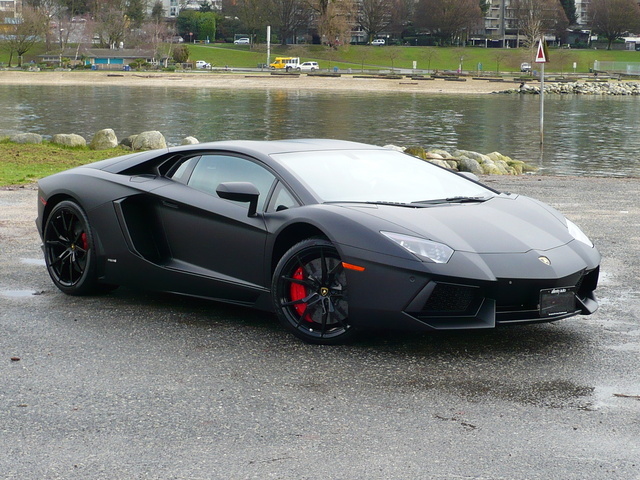 Have you driven a 2015 Lamborghini Aventador?